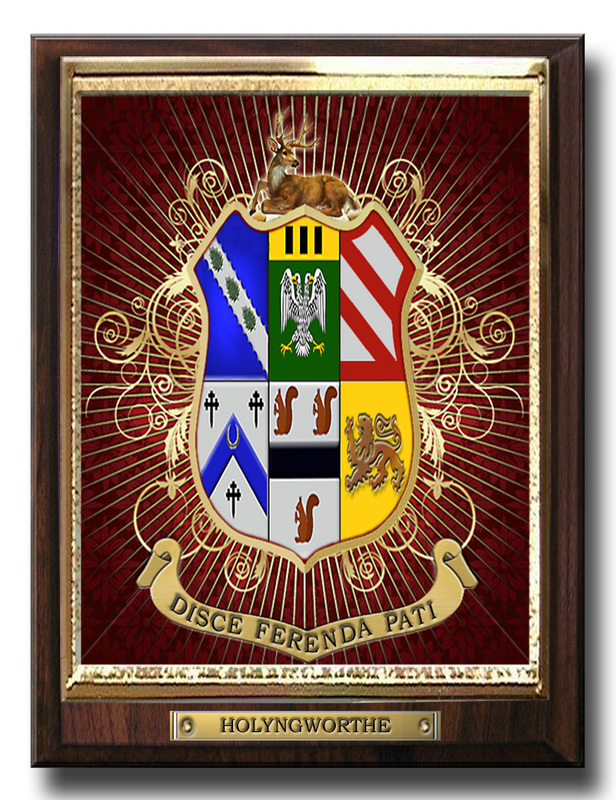 Naturally the coat of arms or family crest should be thought of as art or entertainment and not taken too seriously. The arms on this page are an attempt to illustrate the descriptions from the Burke's General Armory and some other sources. Whether or not they can be actually connected to our modern-day families is in dispute. The original illustration was purchased by me and belongs to me - copy or vary it as you like. Suggestions and corrections for the illustrations and information are welcome (Donna Hollingsworth Hocking olivhill@flash.net). Its doubtful that (being Quakers) the Hollingsworths of America had any interest whatever in crests. 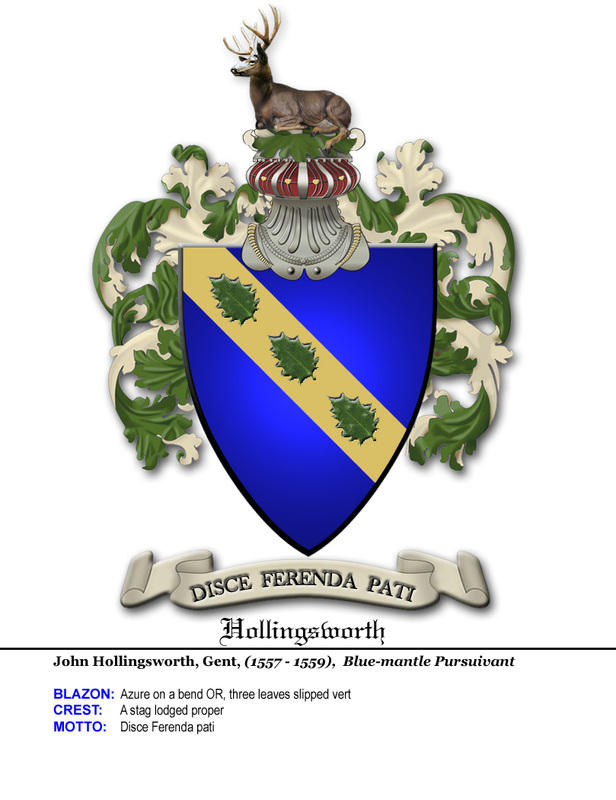 The Quaker Hollingsworth line was indeed descended from Valentine Hollingsworth but which Hollingsworth crest (if any) can be associated with Valentine is in dispute. Popular belief is that Valentine is associated distantly with the family of Hollingsworth Hall. 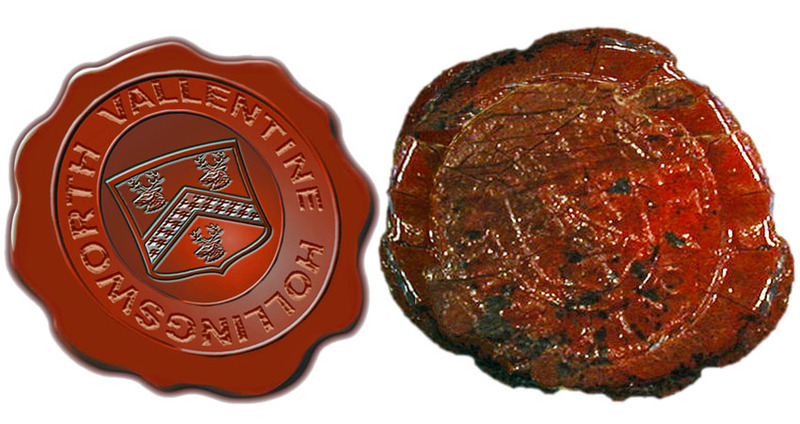 DNA may someday prove what coat of arms may have been associated with Valentines ancestors. 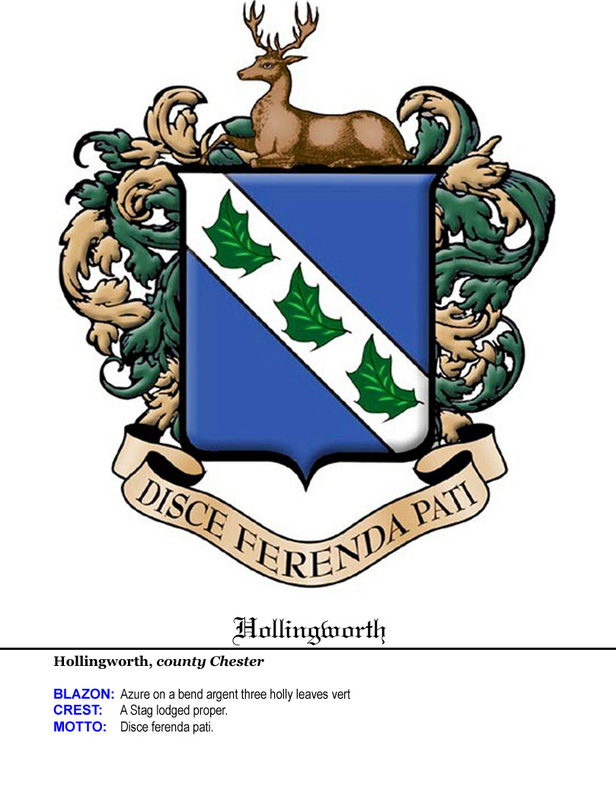 Harry Hollingsworth did fairly extensive research on the three crests. Anyone wishing to follow up on this subject would do well to read his research printed in the Hollingsworth Register, Volume I, number 2, page 87, July 1965; number 3, page 140, October 1965; number 4, page 154, December 1965. As for my family, DNA tests have proven that Levi Hollingsworth (1805-1869) -father of Henry M., grandfather of Roy Sr- was descendant of Valentine and even if a crest for Valentine were proven it would be still be just for fun. Azure on a bend argent three leaves slipped vert. Shield of blue. A silver bend (sash) with three leaves separated from each other. Stag is lying on all fours with its head erect like the sphinx- argent (silver). Stag is lying on all fours with its head erect like the sphinx- proper (natural color). Bear what must be borne. The family name was formerly spelt Holyngworthe, and is evidently derived from the holly tree, called in Cheshire "Hollyn Tree" with which the estate abounded. Sable on a bend OR three holly leaves vert. 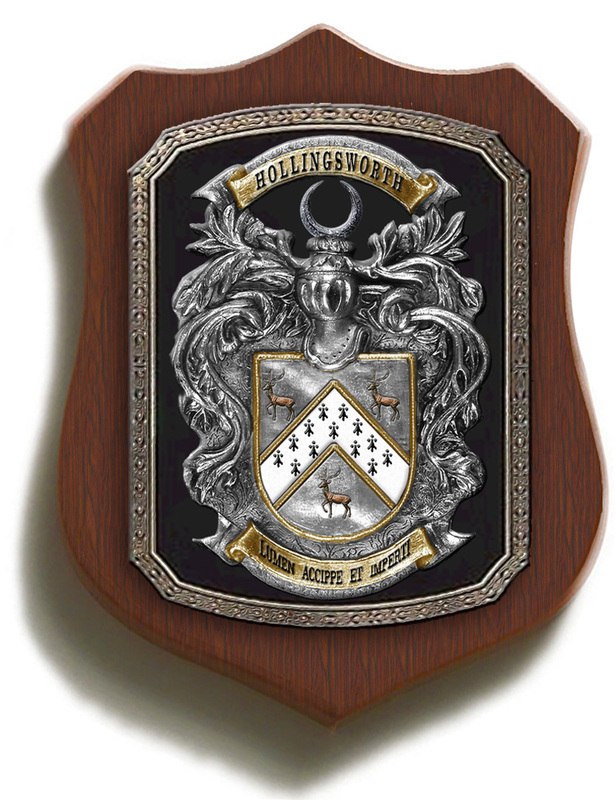 Shield of black. A gold bend (sash) with three leaves separated from each other. Argent, a chevron ermine between three stags trippant proper. 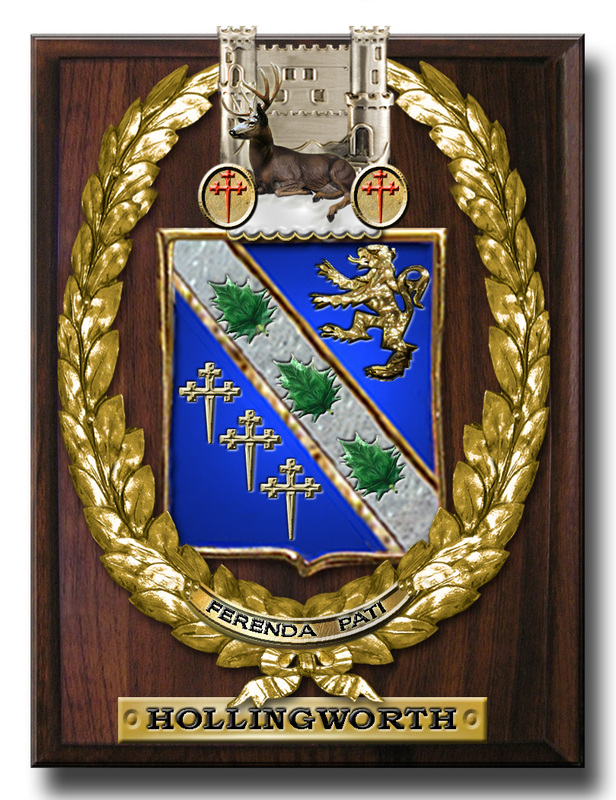 Shield of silver. A chevron of ermine fur with tails showing, set between three naturally colored stags in a trotting attitude. Acquire wisdom and impart it. 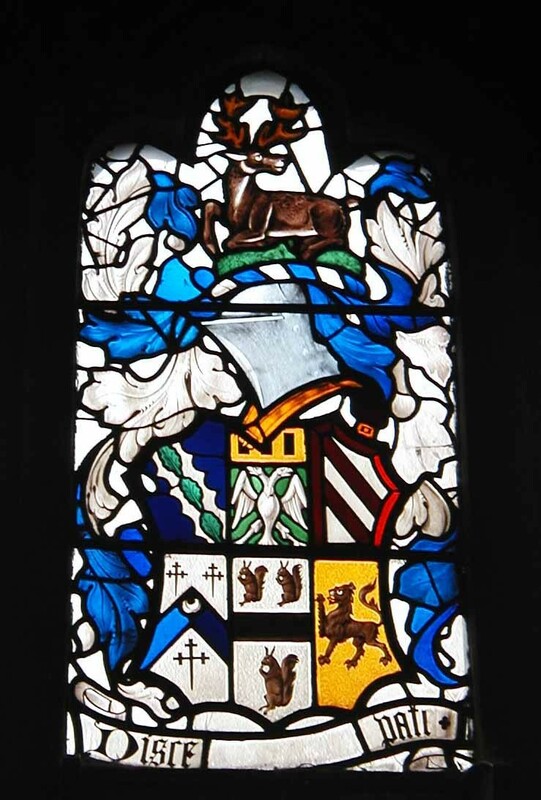 -- a representation of the arms is found in the window of Hollingworth Chapel at the Parish church at Mottram-in-Longdendale. It was placed there by Robert de Holyngworthe when he occupied Hollingsworth Hall (between 1831 - 1865). A Stag couchant regardant, proper. Stag is lying on all fours with its head turned back- proper (natural color). Azure on a bend argent three holly leaves vert. On a wreath, a hart recumbent proper. On a wreath a stag proper (natural color) in a recumbent position. 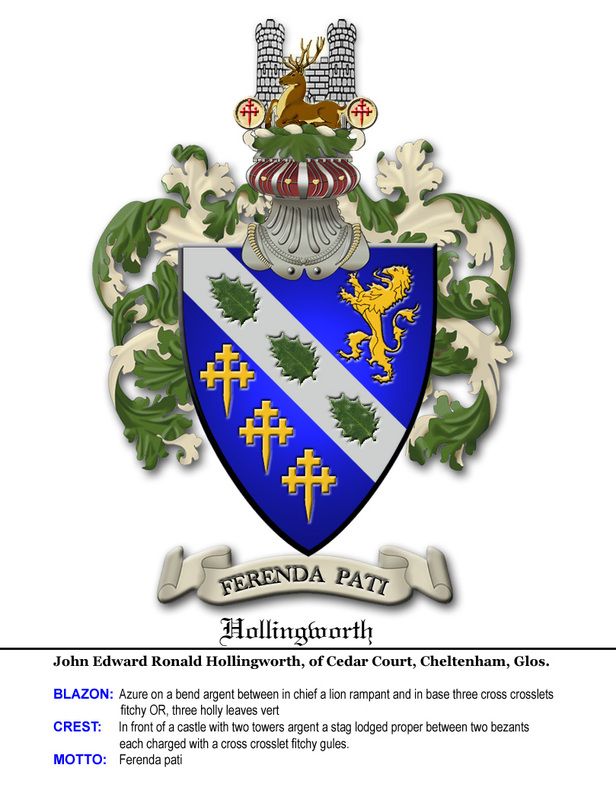 It is presumed that the Junior line were the ancestors of Higam Hollingsworth who seems to be the vendor of the Nether-Hall estate. Azure on a bend OR three leaves slipped vert. 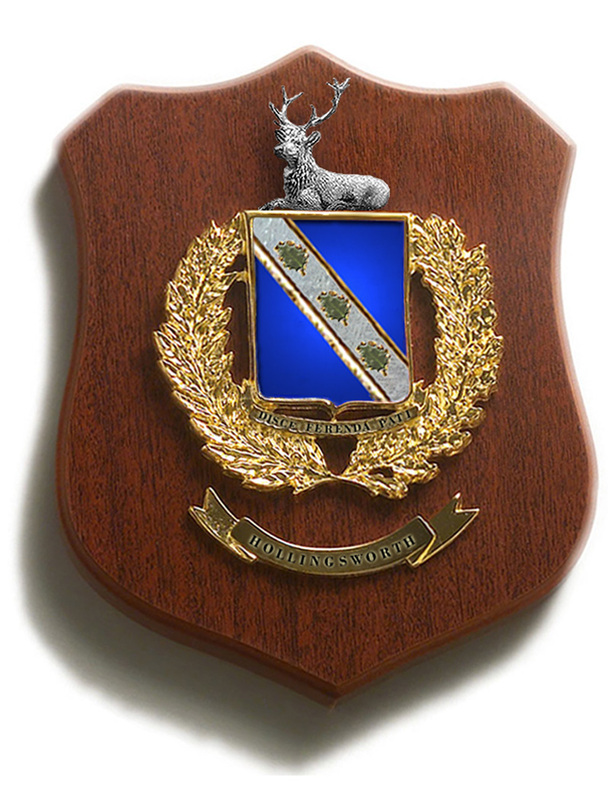 Shield of blue. A gold bend (sash) with three leaves separated from each other. A stag lodged proper. Stag is lying on all fours with its head erect like the sphinx- proper (natural color). Bluemantle Pursuivant of Arms in Ordinary is a junior officer of arms of the College of Arms in London. 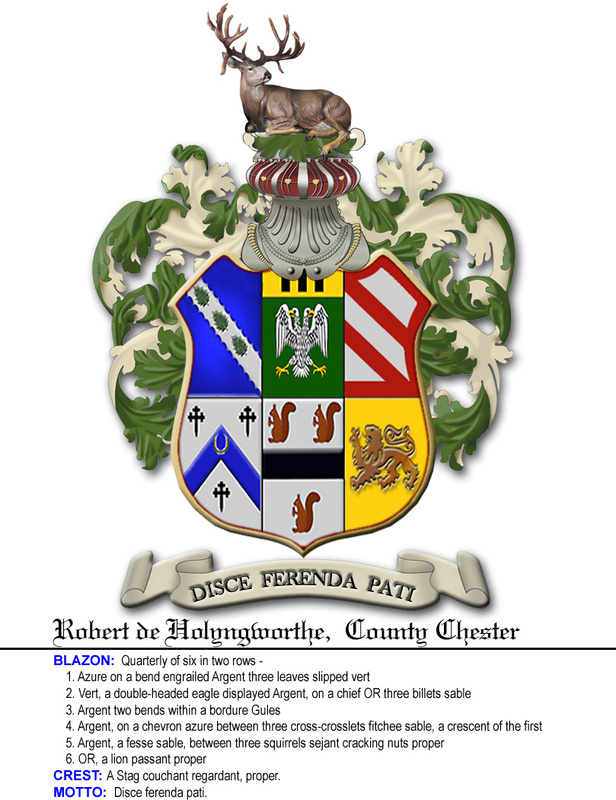 These arms are described (and pictured) in Burke's Peerage & Gentry LLC. (Burke's Peerage & Baronetage 107th Edition, Burke's Landed Gentry 19th Edition) and Burke's Peerage Partnership. (Burke's Landed Gentry 18th Edition). Azure on a bend argent between in chief a lion rampant and in base three cross crosslets fitchy OR, three holly leaves vert. 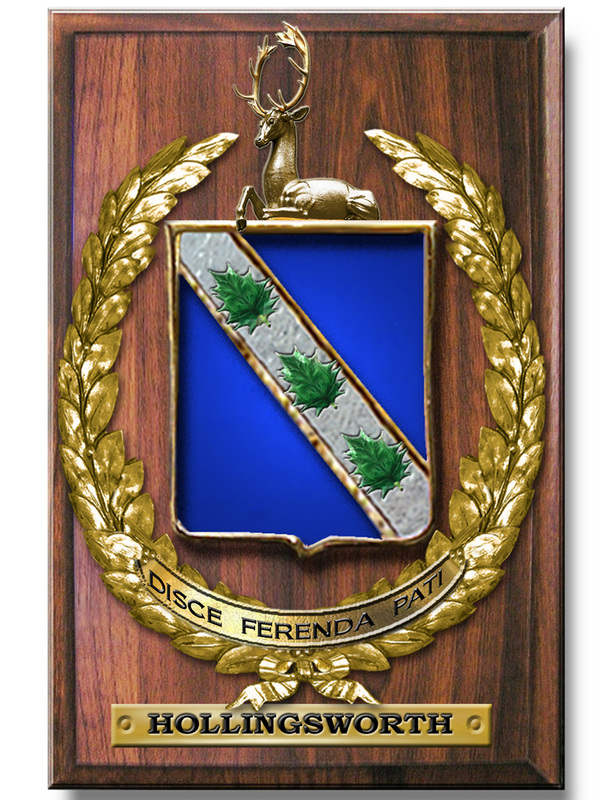 Shield of blue. A silver bend (sash) with three leaves separated from each other. Above the bend a gold lion standing and below 3 crosses each having the three upper ends terminating in three little crosses and fitchy (or sharpened at the lower part; pointed like a dagger). 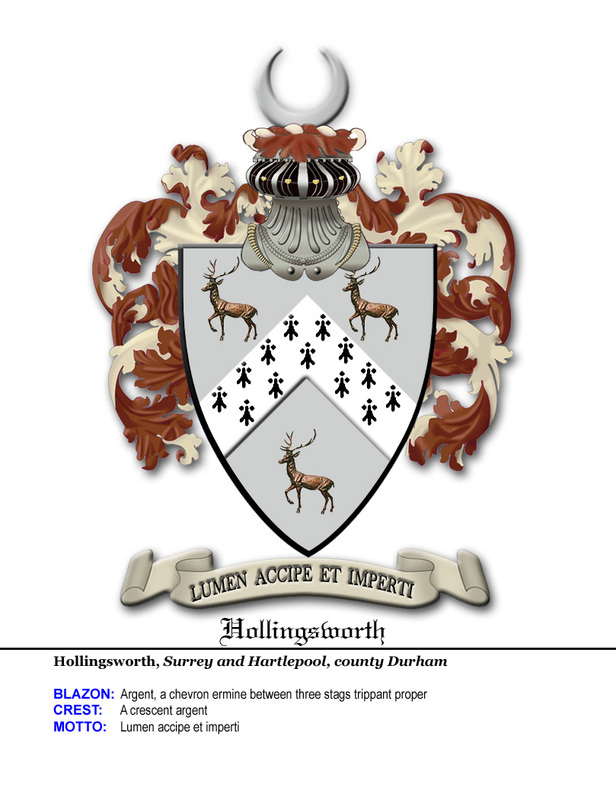 In front of a castle with two towers argent a stag lodged proper between two bezants each charged with a cross crosslet fitchy gules. In front of a silver castle with two towers a Stag is lying on all fours with its head erect like the sphinx- proper (natural color) between two gold coins each imprinted with a red sharpened crosslets. 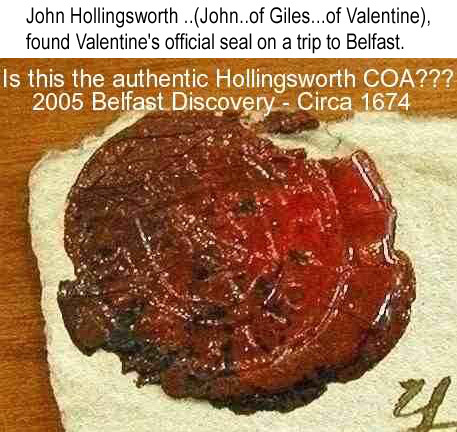 Signature Seal of Valentine Hollingsworth found on a trip to Belfast by John Hollingsworth. 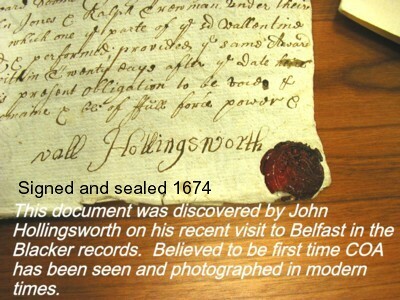 You can read more about the seal on Tom Hollingsworth's site. 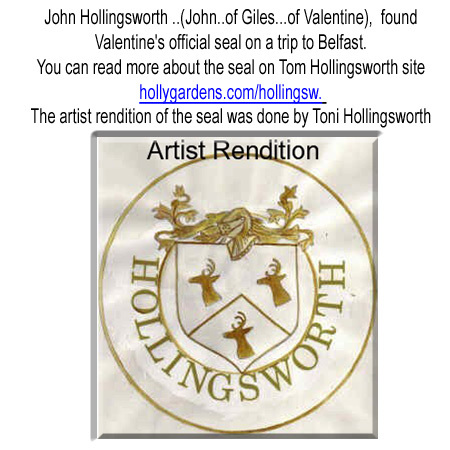 The artist rendition of the seal was done by Toni Hollingsworth (Tom's wife). John says he could not make out the writing around the shield but assumes it must some Latin phrase. I can possibly make out an H and O but maybe it's wishful thinking.